You may have come up with a number of excuses for not cooking with your preschoolers – like how big of a mess they would make or the fact that everyone is hungry, and you need to get dinner on the table quickly. The truth is cooking with preschoolers delivers a number of educational benefits, builds self-confidence, and provides the foundation for a love of cooking and healthy eating for a lifetime. It’s also true that cooking with a preschooler will require a bit of extra planning to make the adventure enjoyable for the both of you – but it can be done! Your preschooler is learning all sorts of new skills and gaining confidence as they accomplish new tasks independently. Cooking activities will be no different as you teach your little one to successfully accomplish kitchen tasks. Your preschooler is quite capable of using cookie cutters, stirring a mixture together like pancake batter, gently tearing lettuce for a salad, and pouring ingredients into a bowl. Start with small tasks and keep whatever you’re doing together fun, remember you’re still working with a preschooler who will enjoy a five or ten minute task but won’t still with you for much longer. As they meet with success, their attention span will grow, and their skill level will develop so they can accomplish more difficult tasks like measuring with cups and spoons, beating eggs with a whisk, mashing potatoes, and more. Whatever you are working on in the kitchen with your preschooler, remember to never leave them unsupervised for safety’s sake. This leads to the next benefit of cooking with preschools – gaining their trust and encouraging them to try new foods. Preschooler tend to be finicky and by inviting your preschooler into the kitchen for cooking you may just create an eater with an adventuresome palate who is not afraid to try new tastes, textures, and smells. If your preschooler helps prepare the dish, tasting the ingredients and talking about the food in positive ways with your, chances are he or she will be ready to try the finished project and even like it! As you work in the kitchen with your preschooler teaching cooking skills, you’ll also be developing math skills while counting ingredients and adding them in, as well as measuring ingredients and learning about parts of the whole (fractions). As you read recipes with your little one, you’re also teaching new vocabulary words and promoting listening skills and following directions. Finally, and maybe the most important benefit is you’ll be enhancing your child’s confidence. As the parent of a preschooler you know they love to show off their new skills and earn your accolades, and what better place than in the kitchen. As they help, tell them how important their assistance was, praising their efforts even if the final result isn’t perfect. 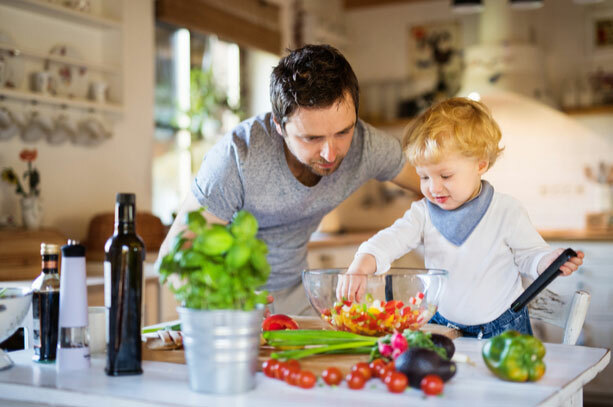 Boosting your child’s confidence, helping them develop needed skills, and fostering a love for food and healthy eating is worth the adventure you’ll have cooking with your preschooler!